Our next day of vacation had us heading into Savannah for some exploration. It was only about a 30 minute drive from Tybee to Savannah, but it seemed to take longer due to several areas of construction. We decided to take an Old Savannah Trolley tour so that we could see all the highlights of Savannah and decide what areas we wanted to hit. Our tour guide, Donnie, was from Savannah, had been a tour guide at Universal Studios, and was a bit of a history buff, so he did a fabulous job navigating and teaching us about Savannah. Savannah is a beautiful, well laid out city with tons of parks throughout. We stayed on the trolley through most of the stops to get a full overview of the history. We saw several historical and movie sites, as well as many beautiful parks, and had a few characters board the trolley to give us some information. We opted to stop at the City Market stop to find a place to eat. I will fully admit to being a foodie and sometimes even a food snob. While in Savannah, I was really hoping to try a place with a little bit of flair, even though some members of our party were pretty hungry and might have eaten anywhere. We ended up at Paula Deen's restaurant, The Lady and Sons. I was pretty excited, even though I had been there before. We all decided to take advantage of the lunch buffet so we could try a little bit of everything. Some of our favorites were the fried chicken, Mac and cheese, green beans, dirty rice, corn casserole, and mashed potatoes. For dessert, we had the choice of peach cobbler, banana pudding, gooey butter cake or Oreo gooey butter cake. I had the gooey butter cake, which was delicious, and Paula is the only non St. Louisan I'd trust with this awesome dish. After eating this meal, we were quite full and knew it was time to get our walk on. From The Lady and Sons, we walked down to River Street, which is home to the Port of Savannah, and many of Savannah's bars and tourist shops. It was fun to watch the boats travel down the Savannah River, while we walked and shopped. Our favorite shops included a cute craft store, where we bought a bow tie collar for our dapper pup and Savannah Bee Company. Savannah Bee Company had honey and mead tasting, along with many beauty products made with honey. By the end of River Street, we were hot, sweaty, and ready to go back to the house. That night we skipped a formal dinner and snacked a little bit as we were pretty full from our lunch. 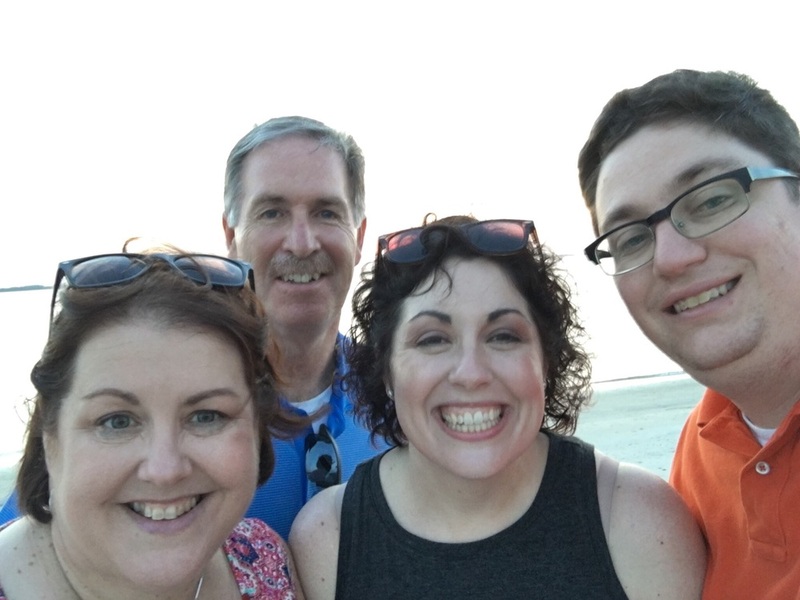 My parents, Mike, and I headed down to the beach at sunset so we could get some pictures and admire the scenery. The beach was really pretty as the sun set and it was a peaceful way to end our day. We tried to get an early bed time in so that we could wake up early for our ecology trip.